This is for all the parents and partners (type 3s) who live with us and love us. And for those who design diabetes devices. Their impact often goes beyond the user. The husband. Photo courtesy of Riva Greenberg. 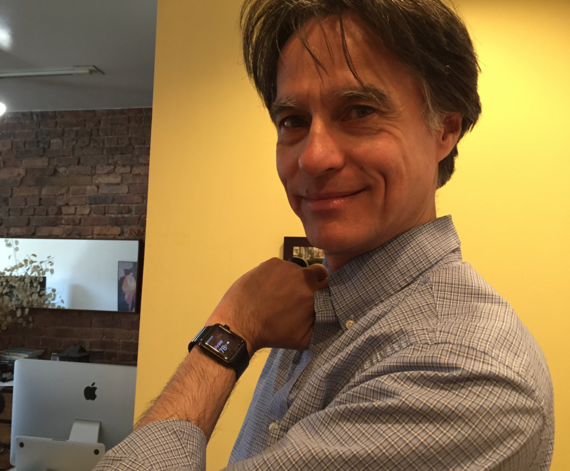 "It's like I'm wearing you on my watch," my husband said smiling shyly, a bit tentative. It's been one full day that I've been using my new Dexcom G5 CGM - and sharing my blood sugar numbers with the husband. I've never shared anything quite this intimate before. If you have diabetes you understand that. Sharing my numbers exposes me: each attempt to keep my blood sugar between those red and yellow lines. This co-mingling is new terrain for the two of us. While my husband's enormously supportive, I'm naturally the one who checks my blood sugars 'round the clock and decides what to do about them, when and how. He may notice I'm low like when I return from a morning walk pale or when he hears the plastic coming off the SweeTarts I'm unwrapping. But his caring and concern previously were as a spectator. Now we both feel he is inside my body, no joke intended. His eyes check my 5-minute glucose numbers on his Apple watch as frequently as my fingers bring the app up on my iPhone. Last night discussing this, he had tears in his eyes telling me what it means to him that he can now keep me safer. For while I didn't set the share alarm to alert him if my blood sugar drops below 55 mg/dl, not wanting to unnecessarily disturb or burden him, he set it for himself. "I can better protect you now," he said. And I realize I do feel safer. Just after lunch today both of us heard the alert that I had dropped below 75 mg/dl due, I now realize, to the after effect of a two hour walk. I went into the kitchen and ate something. Fifteen minutes later he said, "You're 63." "I know I said, I'm giving it a bit of time." "Does it bother you if I tell you that you're 63?," he asked crossing this new terrain. "Not yet," I said. We know this is new territory we're exploring. I know this will give him the closest experience of what it's like to live with type 1 diabetes. What it's like to constantly have a ticker-tape running in your head calculating what your blood sugar is, if it's okay where it is, what caused it to be where it is and do I need to do something about where it is, now? I can see him already making the little mind calculations himself as if he were me. We tread lightly. We realize we may need to establish some friendly boundaries as this sharing continues. We also feel some bedrock has shifted. For while he used to check my CGM in the morning to see whether I was sleeping safely, he can now follow me throughout the day, and at a distance. Like when he's overseas on business and I'm at home, and know that I'm okay. 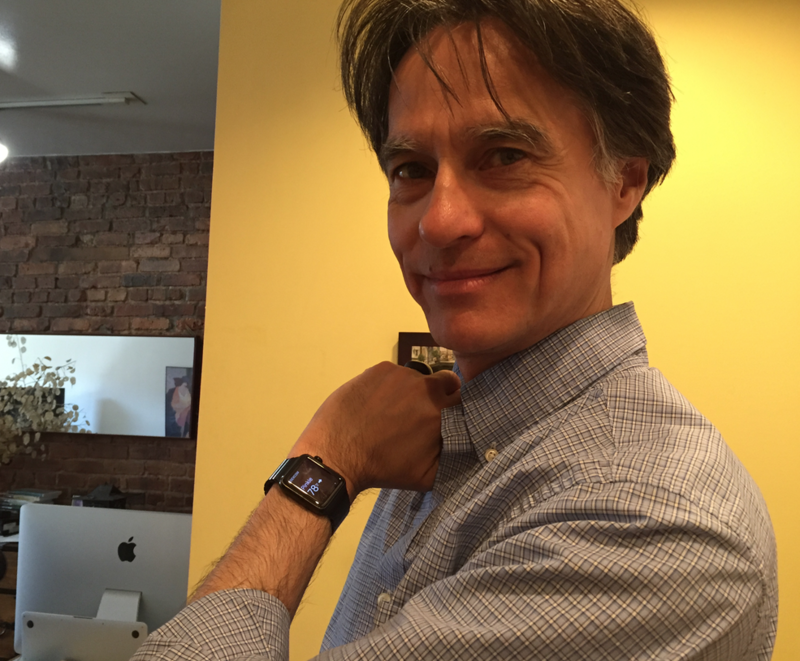 I see a deeper understanding penetrate through the skin beneath his Apple watch. The current carries what it's really like for me to manage my blood sugar every hour, every day, every week, every year. The weight of it lands smack inside his heart. For even after 15 years of marriage, seeing my diabetes management up this close is a game-changer. And, truth be told, there's something profoundly satisfying for me to see this transformation occurring in him. The rest we'll just have to figure out as we go. First published on my blog, DiabetesStories.